Good Morning Everyone on yet another frigid day - it was 5 degrees outside this morning when I drove Lindsey to school...brrrrr!! 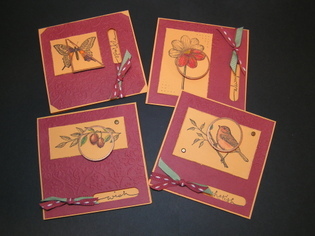 I made these for this weeks Splitcoaststampers Technique Challenge - a set of four - 4 X 4 Gift Cards using the same stamp set.This also covers the Color Challenge for the week - using So Saffron (which I didn't have)so I used Marigold Morning , Cranberry Crisp and Certainly Celery - my Certainly Celery is the ribbon. You and that spotlighting technique....what a perfect combination! Great job! On the wish and sparkle cards, is the background stamped or embossed? And on the always card, what did you use for the piercing? I've been seeing that piercing a lot lately and wondered if you had a template. These look terrific...these spotlight cards are on my to-do list!